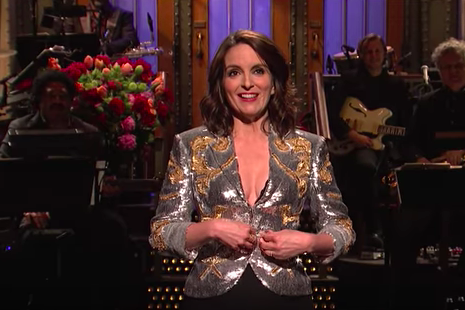 Tina Fey hosted the season 43 finale of ‘SNL’ this year — 20 years since she started working at the show as a writer. And to top it all off, this week she celebrated her 48th birthday. The Upper Darby native and local favorite opened up the show with a monologue that featured a slew of celebrity cameos like Jerry Seinfeld, Robert De Niro, Chris Rock, Anne Hathaway, Donald Glover and Tracy Morgan. This marked her sixth time hosting the show. There were lots of Royal Wedding jokes, some recurring characters and, naturally, a lot of politically charged rhetoric — a staple of all of Fey's best comedy. Fey reprised her Sarah Palin impression, arguably her most famous and successful character on the show. She delivered a message to the people in the Trump White House, joined by other members of Trump’s staff, like Sarah Huckabee Sanders (Aidy Bryant), Kellyanne Conway (Kate McKinnon), Michael Wolff (Fred Armisen), Stormy Daniels (Cecily Strong), Rex Tillerson (John Goodman) and Omarosa Manigault (Leslie Jones). Fey joined cast members Aidy Bryant and Kate McKinnon for a HAIM-style music video about friendship that’s seriously hilarious. And Nicki Minaj did a cameo rap that’s spot on. Fey fans already know the musical adaptation of the comedian’s hit 2004 movie “Mean Girls” has been nominated for many Tony Awards, and is being extremely well received so far on Broadway. The joke is that Fey is solely working behind-the-scenes on the production, but she starred in "Mean Girls" the movie as one of the more featured supporting characters. She pokes fun at herself and her lack of Broadway talent. And she threw in a couple of “Hamilton” jokes too, with a surprising cameo from creator and star of the show, Lin-Manuel Miranda. Kenan Thompson played the Chicago Bishop Michael Curry, who has gone viral since he delivered an impassioned message during the Royal Wedding ceremony. And Weekend Updated hosts Michael Che and Colin Jost did a segment of jokes that were not “not T.V. appropriate” because they were too offensive, but told them anyway. Fey and Melissa Villaseñor put on a mother, daughter routine to "Girls Just Want To Have Fun" by Cyndi Lauper at a high school talent show. Nicki Minaj performed two songs, "Chun-Li" — which sparked debate online about cultural appropriation — and "Poke It Out," both of which will appear on her new album "Queen." In her second performance, she featured Playboi Carti.